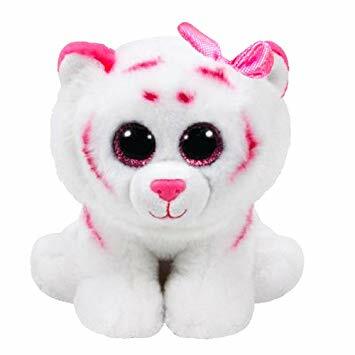 Purrcilla is a white tiger covered in pink stripes. She has large, glittery pink button eyes and a bright pink button nose. Her ears are bright pink and she wears a sparkly pink bow beside her left ear. We can make pretty bows and cook yummy pies. Purrcilla was released in January 2019. Her Birthday is on 10th August. There are two versions of Purrcilla. This small 6″ Beanie Boo and a medium 9″ Beanie Boo Buddy.